Darning is a sewing technique for repairing holes or worn areas in fabric or knitting using needle and thread alone. It is often done by hand, but it is also possible to darn with a sewing machine. Hand darning employs the darning stitch, a simple running stitch in which the thread is "woven" in rows along the grain of the fabric, with the stitcher reversing direction at the end of each row, and then filling in the framework thus created, as if weaving. Darning is a traditional method for repairing fabric damage or holes that do not run along a seam, and where patching is impractical or would create discomfort for the wearer, such as on the heel of a sock. I have to admit that I do not darn. If my sock gets a hole, I throw it out, but I can sure remember my Grandmas darning and patching. Even if I don't darn, I own three darning eggs. 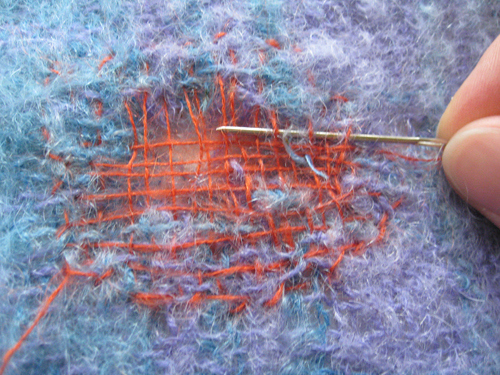 Here is a photo of the darning process from Make: Craft blog. There is even a tutorial on the above link on "how to darn" and more photos of darning. I titled my day 20 nostalgia post "The Lost Art of Darning". But maybe I should ask first, do any of you darn? I have not tried this. I wonder how hard it would be? I'll have to say I've darned a sock or two, when my husband used to wear wool socks. Cotton ones..I just toss if they have a hole. 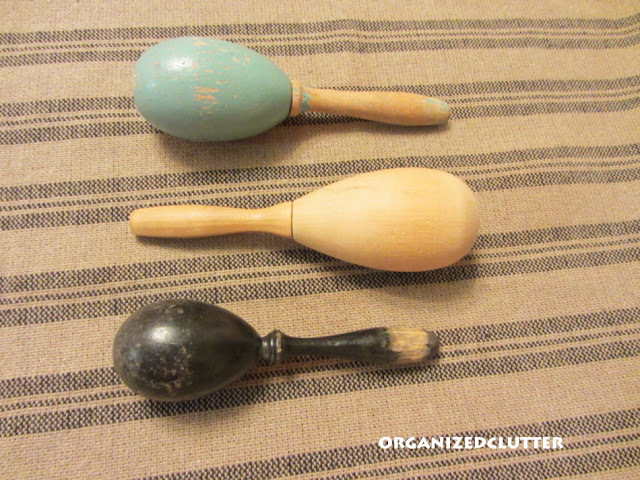 Neat collection of darning eggs. And here I thought Darn was just another, more polite way of saying Damn. Just kidding. I've tried but I didn't really know what I was doing! The closest I come to darn is saying it@! Lol! I have at times darned. not much, but sometimes something is just too important not to repair like this. Love all your nostalgia posts. I am really trying to get caught up, can you tell? By the time I do, you'll be done. I'll miss them. It's been so fun and i know you've put a lot of work into them. Thanks so much! I remember seeing one of those darning tools at my grandmothers when I was young! I grew up with my grandma and mom darning, but since they're first language was/is Spanish I didn't know what it was called. They used a different tool but similar to what your vintage ones are. I never was taught to darn, but wish I had been. I have 4 boys and it's not as easy for me to just buy them new socks or clothes. Now I'll have to find me the tool and take the tutorial. I think it'll be fun to learn. Thank you.